Tribes Overall: "A tremendous experience. The people, the accomodation and the food were all excellent. The wildlife was spectacular." Guides: "Our guide, Andrew, was informed, entertaining and thoroughly good company. " Social & Environmental Responsibility: "Kafunta are certainly trying hard to engage with the local community and the staff seem to be happy and committed. For perfection, I would like to see a more obvious commitment to minimising their enviromental impact." Beautiful spot with a truly spectacular view across the flood plain both in the day and at night. The wildlife is literally on your doorstep. The staff are incredibly friendly and very professional. The food is excellent but, for me personally, I would like to have tasted a greater Zambian influence. Again, great staff. Only suffers in comparison to the Kafunte experience in the fact that the accomodation isn't quite as good. Although the food is very good I think they might be better doing a buffet at lunch. Certainly, the Saturday lunchtime BBQ was tremendous. The camp manager, TJ, is a force of nature and adds greatly to the experience. I thoroughly enjoyed his company in the evenings. If anything, the accomodation is even better than Kafunte and you certainly feel close to nature. I also really enjoyed the communal dining. The highlight of the holiday for me. "I was hoping and expecting that the holiday would be interesting and even exciting (which it was) but I wasn't expecting it to be so relaxing. There were loads of moments when I felt completely calm and relaxed in the spectacular natural environment. The fact that every Zambian and Malawian we met was ready with a smile and a joke greatly helped. Lovely people." Start planning your tailor-made holiday to Zambia. Tell us what you want, and we will tailor make your perfect trip. 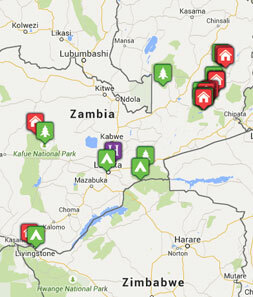  Flight time: Flights from Europe to Lusaka take about 10 hours. Lusaka International Airport is about 25km from the city centre (about 30 minutes transfer).  Language: Zambia's official language is English, but outside of the cities few people speak it.  Visas: Visas are required for most nationalities, although a waiver can normally be organized in advance for British citizens.  Health: This is a malarial country.